If you would like to speed XP up, you can free up to 12 to 70 megs of Ram, by turning off some of these Services you are never going to use. You get to this screen by going to the Control Panel and open the Administrative Tools. These are ALL the Services running in the Background. The ones showing the Started are running the others are either on Manual, if XP needs it it will start it or Disabled. The next screen is when you right click on a Service and go to Properties. This is where you decide what to do with the Service. You can open the Dependencies Tab first, if nothing shows up, go back to the Main screen, ( one shown ) and open the Startup Type box and choose Disable. 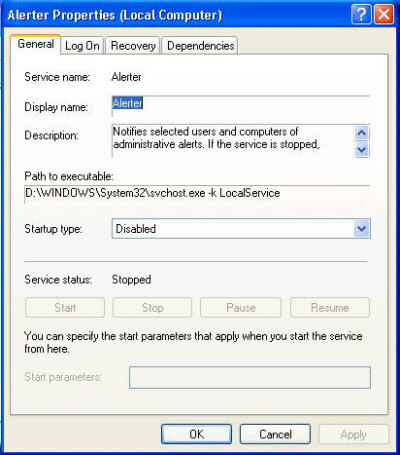 If there are Dependencies, decide if you need this service, if you do not, click the Stop button and then choose Disable or if you are not sure, set it to Manual, that way if XP needs that Service, it will be able to start it. I will direct you to a site that has more information on what to do, it is Blackvipers XP Services Check out what each Service does and his recommendations for that Service, I turned off 55 services running on a single user machine. 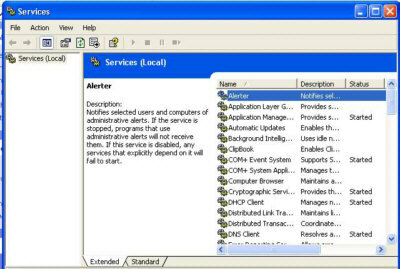 This is really for Advanced Users, if you are a newbie with computers, leave the Services at the Default installed settings.